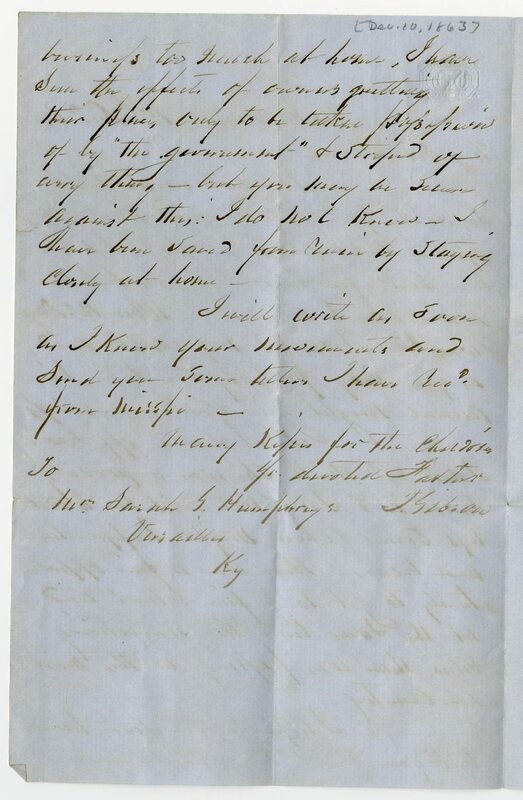 Item description: Letter, dated 10 December 2013, from Tobias Gibson to his daughter, Sarah Gibson “Sallie” Humphreys. He tells her that it might be dangerous for her to leave her property; he had been saved from ruin only by being on his plantation. Item citation: From folder 5 of the Gibson and Humphreys Family Papers #922, Southern Historical Collection, The Wilson Library, University of North Carolina at Chapel Hill. I do not undertake to write you a letter just now. My thought is to let you know that I have been sick for several weeks but am again about as usual. When Mr. Day was here I was at my worst and as you may probibly see him his account might give you uneasiness. 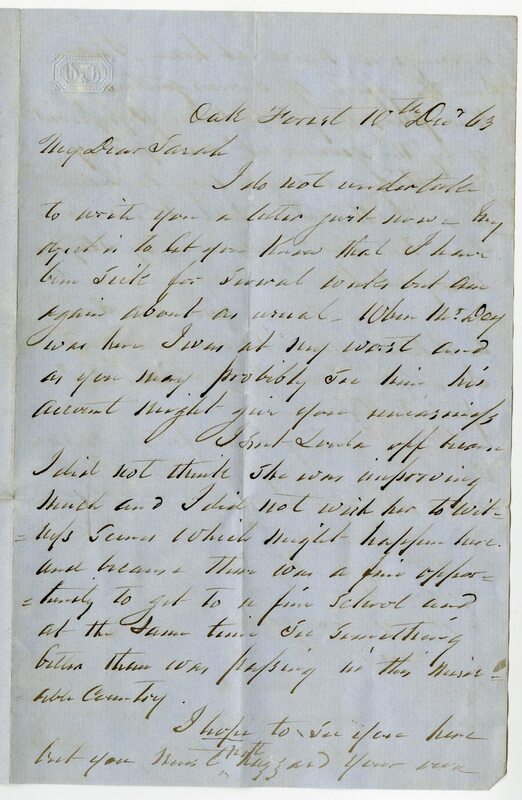 I sent Loula off because I did not think she was improving much and I did not wish her to wit-ness scenes which might happen here and because there was a fine oppor-tunity to get to a fine school and at the same time see something better than was passing in this miser-able country. I hope to see you here but you have (not [hazzar?]) your own business too much at home. I have seen the effects of owners quitting their places only to be taken possession of by “the government” & striped of every thing – but you may be secure against this: I do not know. I have been saved from Ruin by staying closely at home. I will write as soon as I know your [movements?] and send you some letters I have rec’d from Misspi. This entry was posted in Southern Historical Collection and tagged education, Gibson Family, Humphreys family, illness, Kentucky. Bookmark the permalink.